Lee Angol (right) celebrates his second goal at Oldham last season with the help of Jon Taylor (left) and Jermaine Anderson. Photo: Joe Dent/theposh.com. Peterborough United boss Grant McCann has warned his players not to take lowly Oldham lightly in their League One clash at Boundary Park tomorrow (November 26, 3pm kick off). On the face of it, Posh should win comfortably. McCann’s men had won five competitive matches in a row before Tuesday’s (November 22) home reverse to league leaders Scunthorpe. Posh centre-back Ricardo Santos (blue) is in contention for a starting place at Oldham. Photo: Joe Dent/theposh.com. 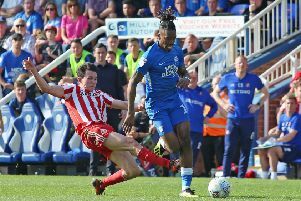 That run has lifted Posh up to sixth, 16 places and 11 points ahead of an Oldham side who won just three League One games this season and scored just 11 goals in 19 matches. The Latics haven’t picked up three points since October 18, but the identity of their victims that night is warning enough. “Oldham have beaten Scunthorpe once and could easily have beaten them again last weekend,” McCann said. “They created lots of chances and they could well have been 3-0 up before they fell behind. Posh centre-back Jack Baldwin is suspended from the game at Oldham. Photo: Joe Dent/theposh.com. “In my mind they are in a false position in the league. They are one of the best footballing sides in the division and they will soon be climbing the table. “My players have been told all this and they will not be complacent. “We’ve been on a good run and we now want to start another one after losing to Scunthorpe ourselves. Gwion Edwards (right) could start for Posh at Oldham. Photo: Joe Dent/theposh.com. McCann has been very consistent with his team selection in recent weeks, but he will have to make at least one change to his starting line-up at Boundary Park. And don’t be surprised to see him make a couple of other changes as he tries to freshen up a team who have sweated hard for the cause this season. Central defender Jack Baldwin is suspended so Michael Bostwick will probably drop into the back four to partner Ryan Tafazolli, although Ricardo Santos and Andrew Hughes are other potential stop-gap centre-backs. That would free up captain Chris Forrester to return to the base of midfield and allow lively midfielder Gwion Edwards a return to the starting line-up. Striker Lee Angol could also start his first League One match of the season. It all started for Angol in this fixture last season when he scored twice on his Football League debut in a 5-1 win. Oldham boss Steve Robinson insists his side are in good spirits after a couple of decent away performances. The Latics followed their 1-0 loss at Scunthorpe with a 2-2 draw at Port Vale on Tuesday. The results left Oldham in 22nd place. “We are creating a lot of chances. It was 17 at Port Vale and I think 20 at Scunthorpe, so I think we are doing the right things. “As long as we don’t go chasing things and keep doing what we’re doing, I’m confident the whole thing will turn for us. “We’re definitely not a team playing without confidence. You don’t create that many chances if you don’t have confident players. “These boys believe in us, the staff, and they believe in each other as well. “They’re starting to get an understanding of a lot more things and they are creating chances.